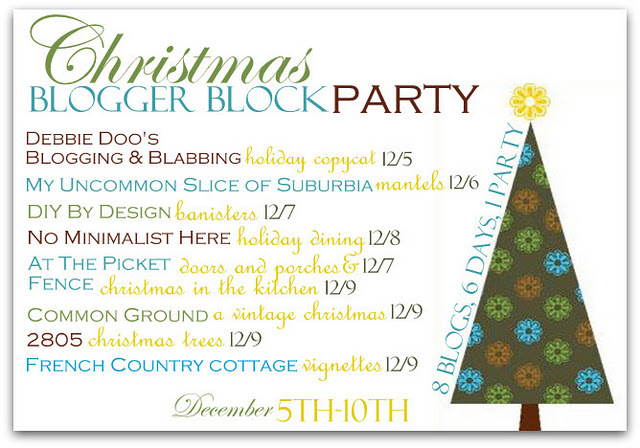 It’s time for the Christmas Blogger Block Party and I am hosting Holiday Dining! I am so happy you could join me. add some coastal touches to our home. I made the little tree from my collection of starfish. way the objects are magnified in the glass. Now you see where I placed the green limpet tree I made for the Copy Cat party. a few tutorials posted on other blogs and it is a easy, inexpensive way to dress up plain candles. As you can see I have replaced some of my mercury glass since the mantel disaster last year. my seashell and glass float collection. I hope you enjoyed the tour of our dining room. like it as much as I do! hand cast by me from original Grand Tour molds from the late 1700’s. so the Intaglios sit away from the glass. have become very rare and expensive, as they have been sought by serious collectors. Leave a comment on this post and let me know you are a follower. everyone..outside USA and non-bloggers welcome. Now on to the Linky Party. Thanks to all the sponsors of the giveaways. Please feel free to grab a button to show you participated in the party. Oh I love your decor! 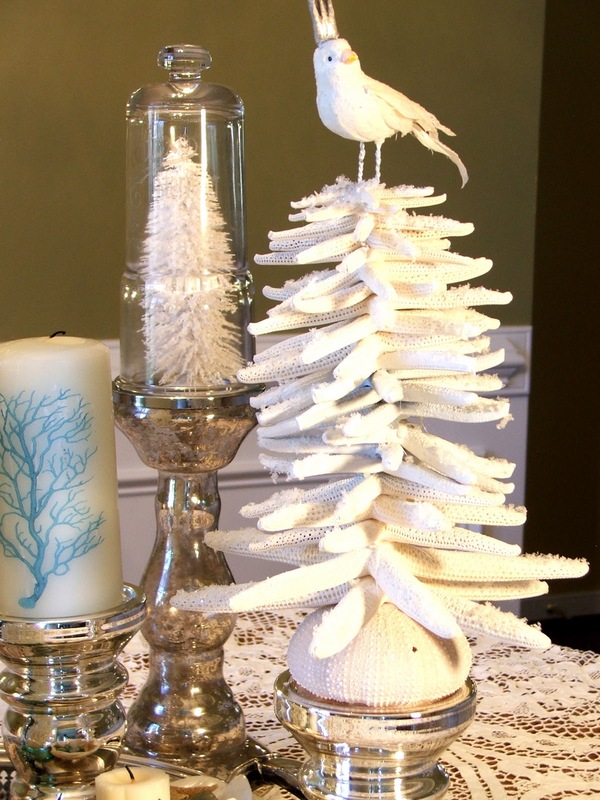 Your copycat tree is so cute, and that starfish one with the bird is to die for! I love mercury glass and have some on my mantel. This is the third year I've use pieces up there. Sure hope I don't have any disasters! I love your piece that is a tall mercury glass with a skinny cloche. It is very unique. The give away is fabulous! I have been a follower for quite some time. Love your blog! It's me again, I am posting your give away on my sidebar. Thanks so much for creating such a fun handmade item to give away! I hope I win – I LOVE intaglios!! Beautiful job on them AND decorating! Oh my gosh, it's stunning! I absolutely loved the starfish tree – what a great idea! Sadly, I don't have dining room decor to share, but I'll be checking out everyone else's posts! Sherry, I just love all of your decor. The silver and blue are so pretty together. The whole coastal theme is just stunning! Thanks so much for hosting this great party! Happy Holidays! Fabulous table Sherry! Love your urn filled with shells. It is all beautiful. Thanks for hosting! Just love the coastal Christmas, so very clever. Richard from My Old Historic house. Oh your decor is just beautiful, Sherry! I love all the colors & the coastal charm of it all, but yet it's very elegant. The intaglios are also beautiful. Very interesting story about them. I am a follower. Your dining room is very pretty, Sherry, as well as elegant and classy. Unfortunately I don't do a table setting, so I don't get to play with everyone at your party, but I will be lurking alot :). Your give-a-way is very generous. Gorgeous! I love the use of the starfish! Thanks for hosting this fun party ! Your giveaway is amazing.. I'm a happy follower. Sherry, thanks for hosting your home is just beautiful.. I decorated my friends Home in Teal and sliver.. I just love those colors.. Happy Holidays from me to you…. So many beautiful items in each vignette! It's amazing how well sea items and snow go together. Your's is one of the first blogs I started following when I discovered "blogland" last spring. Beautiful table. Thank you for hosting. And yes, I FOLLOW YOU!!! Love the giveaway! I hope I win!! Sherry, your Intaglios are so pretty and framed so nicely. Thanks for hosting the Block Party. The coastal inspired tablescape is very pretty. Sherry, I love the beach and your beach inspiration is beautiful! I follow you! Thanks for hosting and the chance to win! 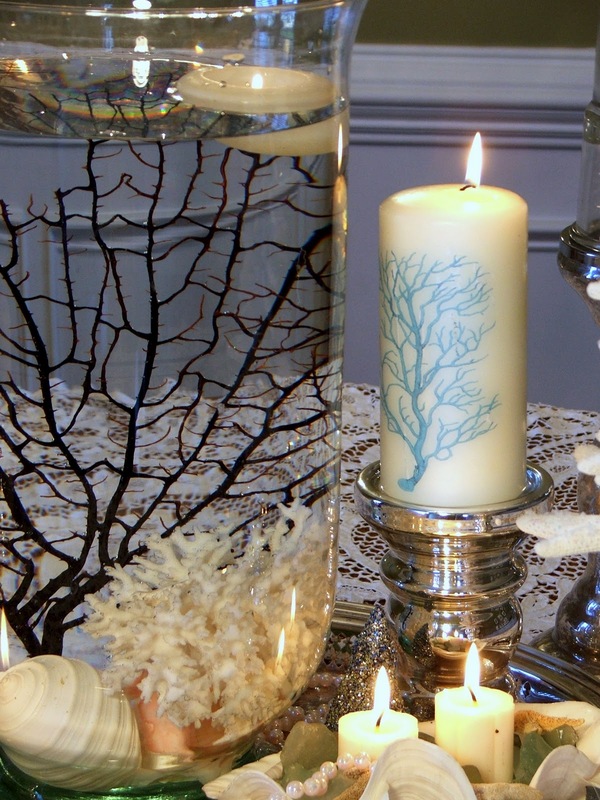 Now you must know that I LOVE all the coastal touches…it all looks stunning!!! I'm a happy follower and would love to WIN! Your dining room is stunning, Sherry, absolutely breathtaking! The beautiful coastal theme and colors are fabulous! Unfortunately for me, I don't do tables…but will enjoy visiting with some of your guests. Maybe I'll learn a thing or two! I adore all your coastal decorations, and I am going to have to investigate the tissue paper and hairdryer technique to embellish candles. Yours look fabulous with your other items. Please count me in your giveaway. The intaglios are gorgeous and even more special because they were made by you. I am definitely a follower. wow- your decor is beautiful! i love the beachy feel and the colors- just gorgeous! Your vignette is gorgeous! Love your starfish tree…so creative. I'm a follower, thanks so much for the chance to win! Your giveaway is on my sidebar! Thanks so much for the chance to win!!! Just beautiful, Sherry! You have definitely given yourself a bit of the ocean with all these lovely pieces. I love your coastal touches and the colors that you chose. The starfish tree with the bird on top is so pretty and the water arrangement is fantastic. It all looks so magical and lovely. Your giveaway is unbelieveable and You have really created a work of art. All is so beautiful..I especially love the starfish tree you crafted…very pretty. Thanks for hosting this fun event. Sherry your dining room is gorgeous! I swooned a little at that star fish tree with the little bird a top! Love love love all the shells for Christmas! Sherry, I love your coastal inspired decorations. Just gorgeous and thanks for hosting. That is so gorgeous Sherry! I love blue all shades all ways. Thanks for hosting. I love the tree made from starfish ! You have a lovely dining room . Makes me want to be by the sea . Thank you for hosting ! Hope I win the giveaway ! Wow! This is gorgeous. I've always loved coastal decor. I'm an ocean-girl at heart! First time linking up! Thanks for hosting and I love your blog…I'm no minimalist either. I have many collections. Your coastal decor is gorgeous. I like the juxtaposition of the porous and very clever starfish tree with the sparkle of the ornaments and limpet tree. Linking up for the first time. Thanks for hosting. Looks like we are on the same decorating wavelength this year! 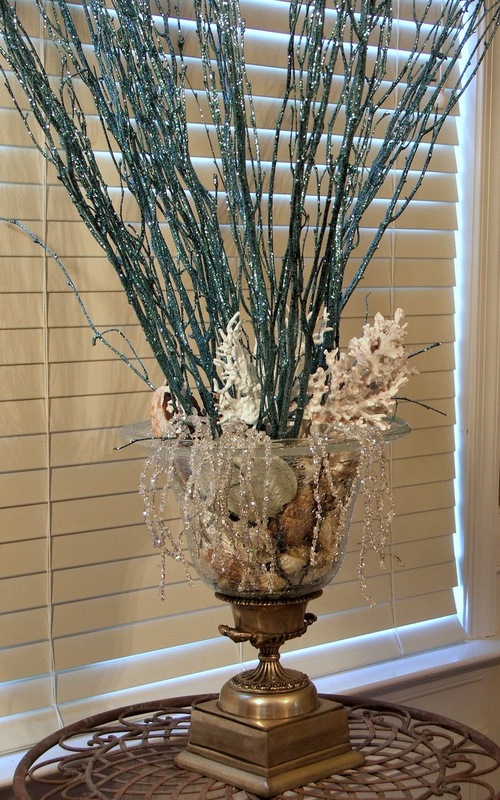 I just linked up my Silver Sea and Shells Centerpiece! I adore your table – that basket full of starfish – I want! Amazing. Your intaglio creation is remarkable! I'm following. Please enter me in your giveaway. Forget to mention I would love to win those Intaglios! Pinned some of these pics too! Have a wonderful Christmas, and thank you for hosting. I would love to win your giveaway. I've been a follower for awhile. I love your parties and try to come and visit each week. I'm posting your give away on my sidebar. Your artwork is beautiful. Your table is so very pretty, Sherry! I am in love with the starfish tree! Your color scheme of silver, blue and white is just fabulous! Thank you for hosting the tablescape party, I am enjoying it! And thank you also for such a wonderful giveaway…I am a follower! Love all the coastal accents on your table. Thanks for being part of this great event and allowing us to paticipate. OK…I love love love the blue! Everything look simply gorgeous in your dining room! And your give away is dynomite. I love Greece and everything that goes with it! Following you now…will be back in a minute with another post regarding your give away!!! Your giveaway is posted on my sidebar…it is really beautiful. Thank you for offering such a fabulous giveaway!!! Thanks for hosting the linky party. I love your coastal Christmas decorations. I'm a follower, by the way. I love your shell theme and the blue, white and silver is stunning. Thank you for hosting the party. It is so much fun. Amazing giveaway, too. I have enjoyed following your blog for a long time. The intagios are wonderful. Sherry, I love your holiday table! 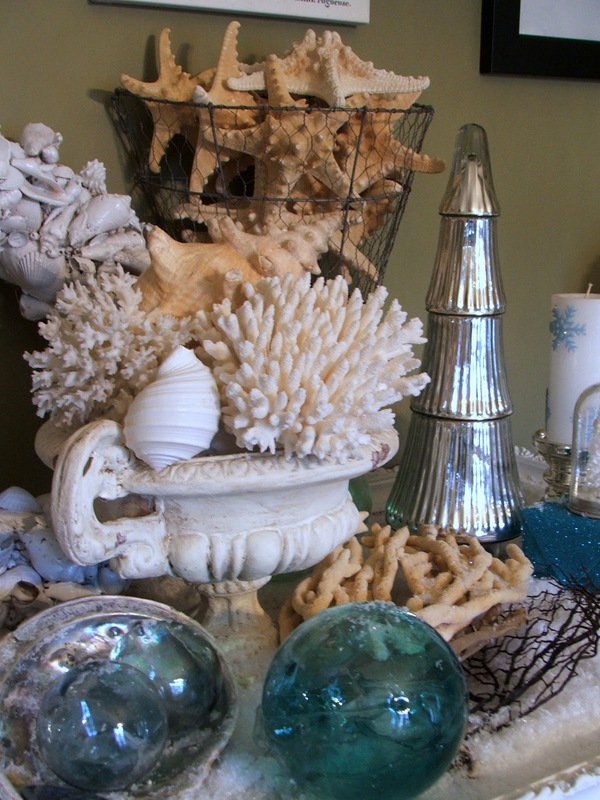 Your coastal decorations are perfect! I would have never thought of making a tree from starfish! Thanks for sharing such a great idea! I love the coast too and I think it's a great decorating choice! Thank you for hosting this link! It's always fun to see all of the great ideas! Love the blues in your holiday diningroom! 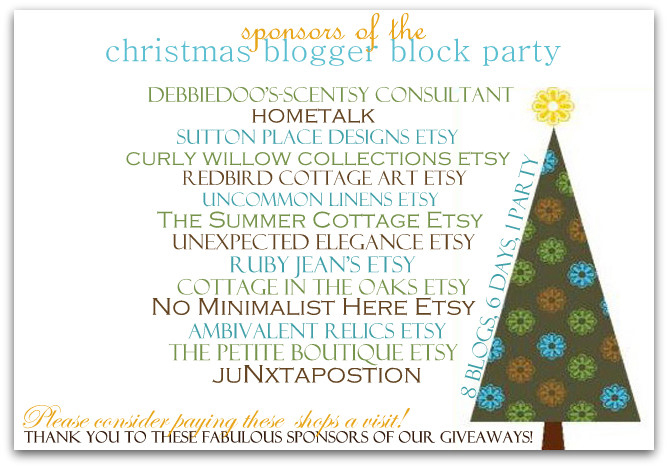 I've been a follower of yours for a while now, thanks for the beautiful giveaway and for hosting this great holiday party! Stopping by for the first time and linked to your Christmas Party! Lovely place you have here! Looking forward to perusing some more and visiting others that have joined the party. Beautiful and so unique! We've been in FL for almost 46 years now! Thanks for hosting, I'm joining in! 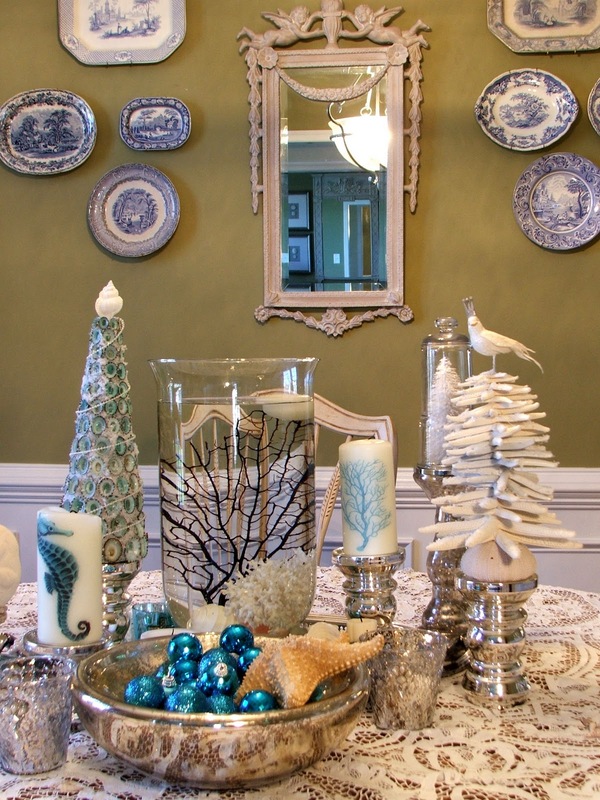 What amazing holiday decor…I love the Coastal Christmas theme. Being of Italian descent I love this giveaway more than you can imagine. I haven't been back there since the late 80's but I love Italy. I would love to win this giveaway..fingers crossed. Thanks for the party! I love the urn with the tall sticks – although I like everything. The blue glass balls are really neat. Just linked up at 2:30 a.m. What am I doing up this late!!!!! 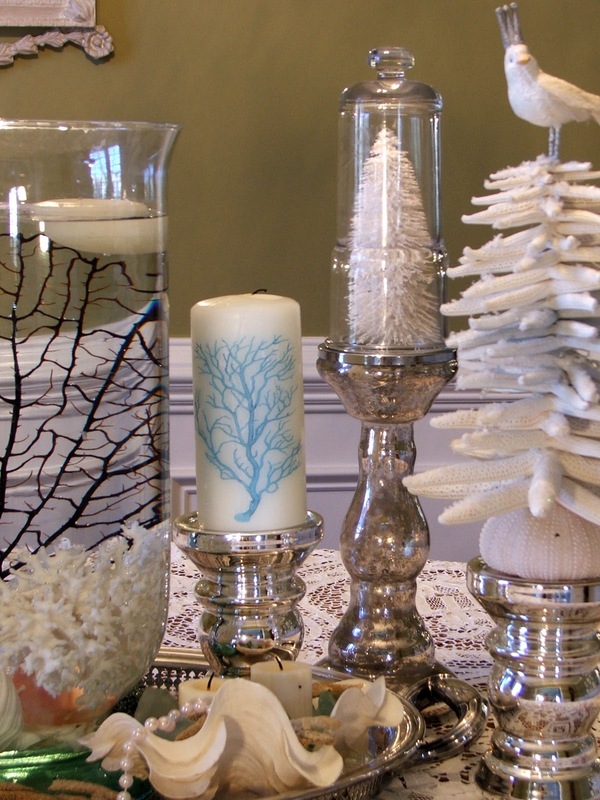 Your beachy Christmas decor is so pretty. Love the copycat tree. Love the Framed Intaglios too. Yep I follow…be back in a sec. I am still working on decorating clients homes for the holidays…my last set up is in the morning..and then I can finish decorating my house! I decided to share a holiday market I participated in over the weekend! Love all your seashell accents! Got the giveaway on my sidebar. Thank you for hosting Sherry! Lovely decor you have here! I can't wait to grab a cup of coffee and visit others to see how they are decorating for the holiday season. Wow. My first visit here. I love the starfish tree! Loving your coastal decor. Very Pretty. I have posted your giveaway on my sidebar. Would love to win. I love the blue/white combo of your decor! I was able to link up my DIY Vintage Aluminum wreath-which is cheap & easy to do. I hope you enjoy it. Thanks for hosting the party once more! I hope I win, what a lovely beachy table you have created! I love the sparkle to it! Beautiful and creative Christmas decorating. I love the limpit and starfish trees. AMAZING! Yeah! I'm here! Finally. Whew. What a whirlwind keeping up with all the parties…who were the crazy ladies that planned this thing! lol 😉 Sherry, your dining room is BEYOND amazing! I am drooling over every detail…love, love, love! Thank you so much for helping us host the party! Love ya! 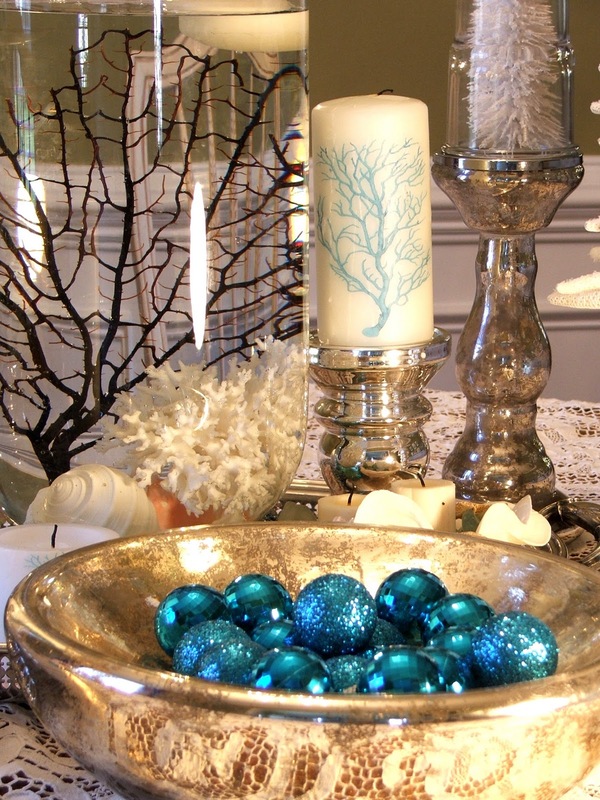 Your table scape looks great, I love how the blue from your decorations make the green on your walls stand out, and I absolutely love all the mercury glass decorations! I'm your newest follower! Beautiful, Sherry…the starfish tree is so unique. So sad I don't have a dining post but I still wanted to stop by and say that your beachy tablesetting is absolutely crazy beautiful. If I didn't run a preschool in my home I would totally want it to look like yours. Have a great day…I'm off to check out what others have done! What a pretty Christmas you have going!!! Thanks for letting me join you fun party! Just found your blog. 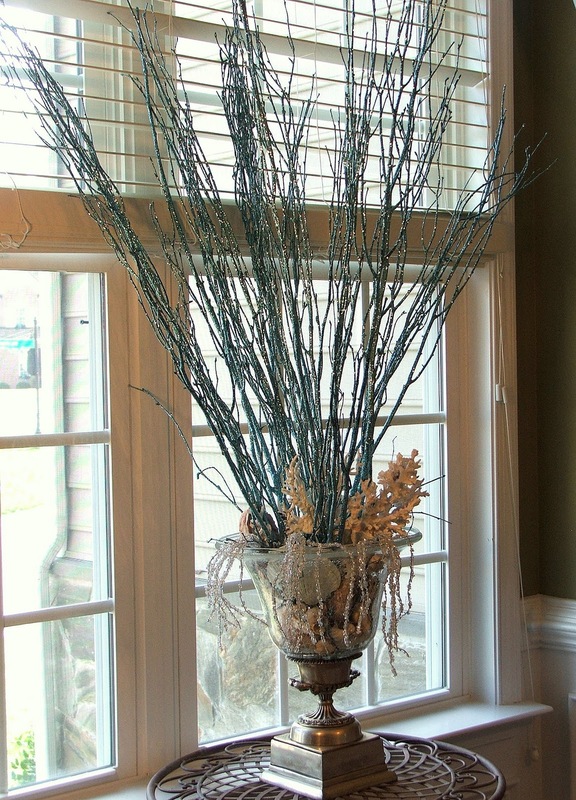 Love your vignette in the dining room. 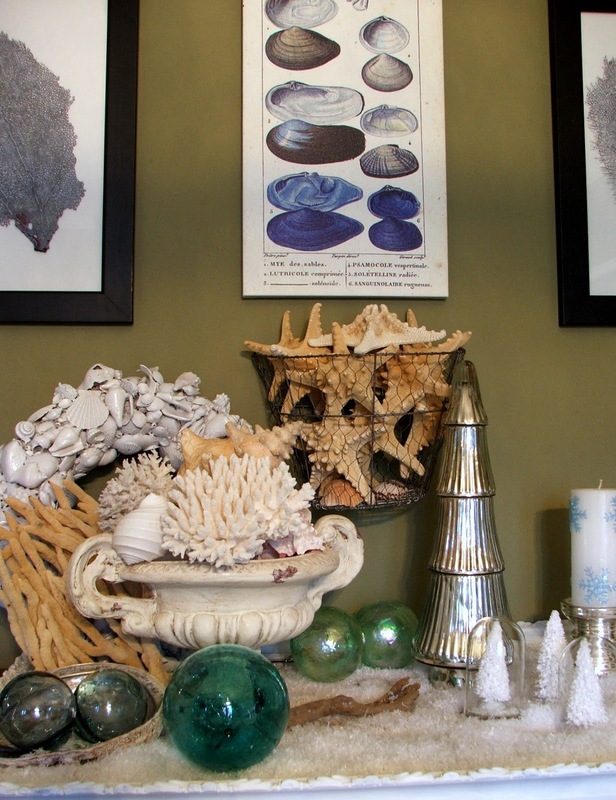 Live on the Gulf Coast in Florida and am always trying to feature my seashore finds in my decorating. Love your blog, I am now your newest follower. Thanks for the chance to win. Hi Sherry, Your decor is just stunning and What a wonderful job you did on the intaglios, I would love to be in the drawing! I am already a follower so please toss my name in the hat.. Thank you Sherry for the party! Everyone's entries look spectacular! I appreciate the opportunity to win the intaglios. They would be amazing. Good luck to everyone! thanks for sharing your amazing decor photos. yes, i am a follower! Thank you for hosting the party. It is my 1st time participating! I love all your aqua, white, & silver items! Please enter me for your giveaway; what a unique, beautiful framed piece! 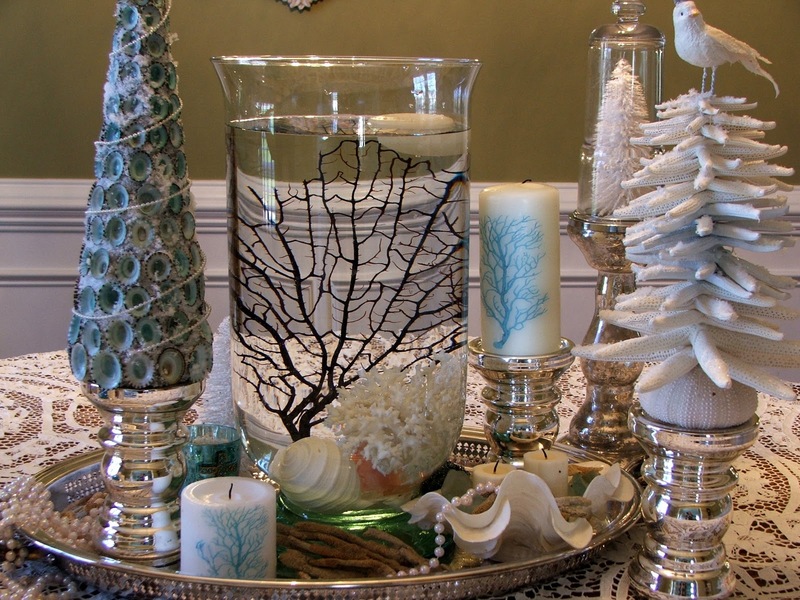 Love your beachy Christmas decor. The italgios you framed are lovely, please enter me in the drawing. I have been a follower of yours for a while now. Merry Christmas! A billion comments. Wow! I get it though. You are very creative and extreemly talented. K, now send me stuff. Peace. Hello! Lovely party – I just love your combination of blue, white and gold! Stunning! Thank you for hosting and I am a happy follower! I love the starfish! I hope I win! LoVe everything about this post Sherry! Especially all the coastal cleverness and the beautifully framed intaglios!! I absolutely LOVE your coastal decor, it really is gorgeous! And what a wonderful giveaway, thank you for the chance to win! Thanks for hosting the party. Your dining room is stunning and so many clever touches. Most of all I love the starfish "tree." What a great idea. If I had starfish, I'd copy it. I also like your decorating style. The color on your walls in the dining room is a perfect host to your decorations. I enjoy blue transferware too and have a wonderful collection of Allerton's Blue Willow. Merry Christmas. Wow, Sherry I am always blown away by what you do! You really have such a fine touch. I love your dining room… all of it. 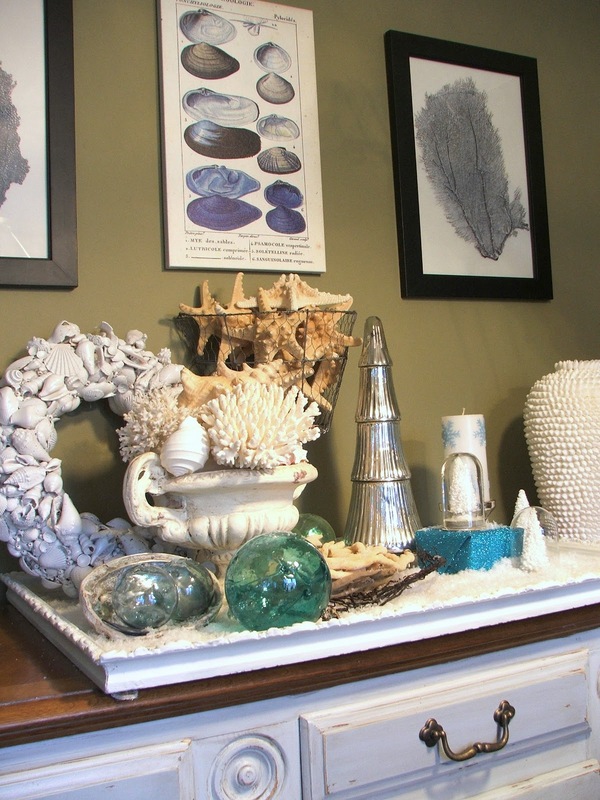 I love coastal decor and try to incorporate some in my home also. I also have been a fan of the Intaglios for quite sometime and did a copycat upcycle with seashells at http://highpointcircle.blogspot.com/2011/07/another-upcycle.html. I would love to win the real deal! I posted about your giveaway in my sidebar. Thanks for this opportunity and Merry Christmas to all! Just discovered blogging, fascinated with your website adding it to my home page. Your unique and clever coastal arrangement so beautiful, wish I could recreate it here before our company arrives. Thanks for sharing. Intaglios and their history were new to me, what a lovely idea to display them like you have. Thanks so much for sharing all your beautiful ideas. 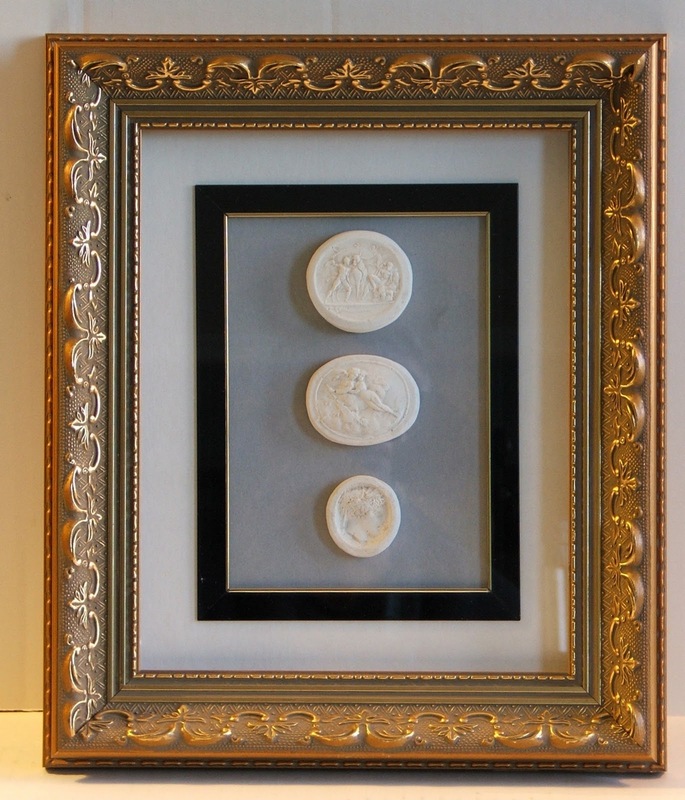 I just fell in love with this Amazing wood frame with three mounted Intaglios! Sherry, This is GORGEOUS! I love how you cared so perfectly for every detail! The starfish Christmas Tree is my favorite!!! I'm excited to be your newest follower and hope you'll stop by and visit and follow me, too! Really beautiful! Thank you for the chance to win the intaglios. Just kidding, no…. not really! Truly, this is THE best giveaway EVER! Great ideas! Love the frame! I posted and forgot to say that I am now a GFC follower!! I always enjoy your blog! Thanks for such lovely ideas – it's special to see how items are used in different homes ~ I think your "give away" is fabulous !! That tall cloche is really nice and different from others. I enjoy your blog. I have your blog bookmarked – near the top of my list! Hi Sherry, I am a follower of your blog! Your decor is beautiful and so inspiring. I love the give away and what a labor of love and enjoyed the history of the art. A follow I am. Please know that the most interesting thing about your giveaway is that you have furnished the history behind your project gift. History is 'one of my great loves' and had I been a teacher this would have been my major. I'm now following your blog. Love your style! I would love to win the intaglios, so beautiful. I've been following your blog for a while and love it! 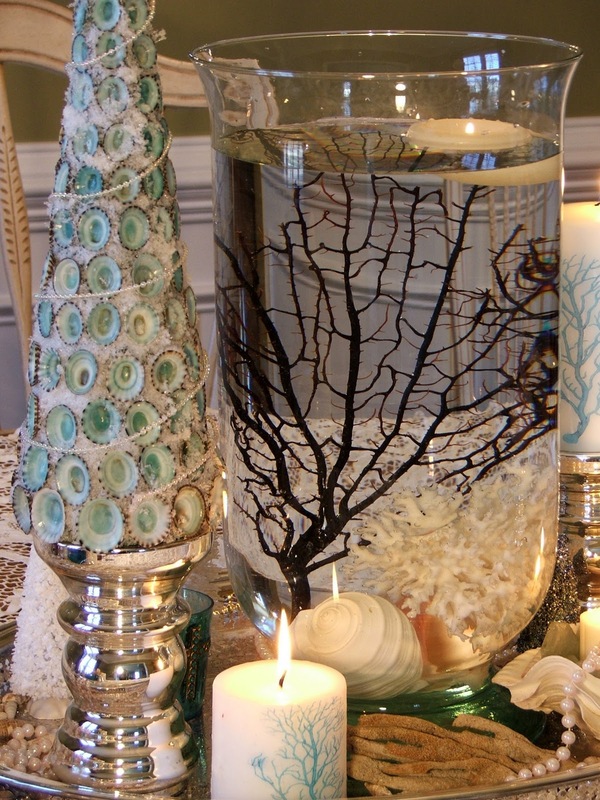 Beautiful tablescape ideas, especially with the sea shells and intaglios. What a beautiful giveaway! I'd be thrilled to win! I follow you and would love to win this beautiful giveaway! Merry Christmas!! I love your blog and the intaglios are incredible! I'm inspired by everything you do! I enjoy viewing your posts when I receive them in my email box. I would love to win the beautiful intaglios. Happy Holidays! I love your blog. I am no minimalist either. I am leaving Christmas Day for Italy to visit my son who is stationed there (army). I would love to win your giveaway. I am following on GF. Hi, I would love to win your giveaway! I love your blog. I love your give away intaglios! You are so lucky to have the original old molds! And so clever to actually do something with them! I have been following your blog for about 6 months now, and enjoy every post. Keep 'um coming! Great job! It was so fantastic. You're really had a brilliant idea. Keep it up.